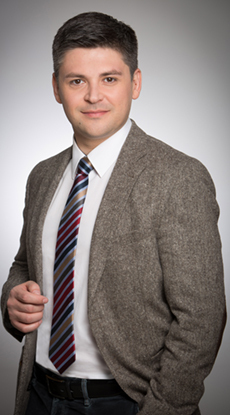 Mr Iulian Popescu is an experienced practitioner in Corporate & Commercial matters, with a focus on public and private mergers & acquisitions, corporate finance, disposals, joint-ventures and negotiation of various commercial contracts. He distinguished himself as an experienced and dynamic lawyer being involved in advising a significant portfolio of clients from sectors such as energy, constructions, pharma or telecom on all aspects of their businesses. His broad experience also includes advisory work as leading lawyer in large infrastructure projects, being particularly skilled in public acquisitions and PPPs, concession law and licensing / regulatory issues. Other areas of expertise include Telecom, IT & Media. He advised international and domestic telecom operators, media and technology companies, on the full range of matters related to IT law – software and service distribution, interconnection and outsourcing agreements, online commerce or data protection. 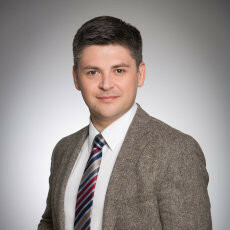 His diverse practice focuses as well on Shipping, Aviation & Transport, with particular emphasis on shipping and admiralty, where he has proven extensive experience in dealing with contentious and non-contentious matters related to multi-jurisdictional disputes and transactions. One of the major US-based worldwide telecommunications companies and its Romania-based subsidiary with respect to ongoing corporate and regulatory issues regarding the localization of its global services agreements. The largest worldwide search engine provider in relation to a wide spectrum of IT&C, corporate, contacting and data usage and protection matters, including the localization and implementation of various products and services for Romania. One of the world’s leading companies in consulting, technology and outsourcing in connection with the opening and operation of its outsourcing center in Romania. Also assisting the client in the structuring and implementation of a merger process of their several subsidiaries in Romania. The leading network operator in Italy in relation to general telecommunication regulatory requirements, as well as to the operation of its Romanian subsidiary. A worldwide US-based computer chips producer on all corporate matters involved in the opening of its subsidiary in Romania. The largest worldwide mobile communications manufacturer in relation to the launch of various services in Romania. The international consortium retained by the Romanian Government to conduct the sale of one of the top three telecom operators in Romania, including providing legal assistance throughout the entire sale process, performing a due diligence exercise on the target, drafting the sale strategy and performing all other actions necessary to carry out the privatization process to a successful transaction. A leading international provider of facilities solutions to the oil & gas production and processing industry, in connection with the negotiation and implementation of a production enhancement services agreement for several oil deposits of the largest Romanian oil and gas group. The Romanian subsidiary of a leading French financial institution in connection with the off–market and regulated transactions in Romania under European Union Emissions Trading Scheme concerning greenhouse gas emission allowances. A leading Australia-based mining company with a focus on copper on its EUR 200 million attempted acquisition (via privatization) of a leading Romanian mining company. The Romanian subsidiary of the largest European household appliances maker in connection with the environmental liabilities entailed by the sale–purchase of a land property affected by historical contamination. One of the world’s leading companies in the water treatment field with respect to complex legal matters related to the permitting requirements regarding water waste disposal, further to the acquisition of the operation, maintenance and refurbishment of two water waste treatment plants in Romania. An important investor in green energy projects in connection with various environmental issues related to the development of a wind farm project in Romania, including providing legal advice for implementing the project, as well as day to day legal assistance. A Romanian metallurgic producer in connection with the temporary suspension of the production activity with due regard to the company’s integrated environmental authorization and permitting requirements. A leading chemical industry international player specialized in the manufacturing of high value aroma chemicals, with respect to their Romanian chemical plant and especially their compliance with the environmental regulatory framework. A leading real–estate developer in relation to environmental related issues concerning the development and operation of various real estate projects, including the requisite permitting, and handling of disputes related to alleged excess of noise, vibration and emission levels, together with the monitoring of the relationship with the competent authorities. One of the leading real-estate developers in the mediation proceedings concerning a claim related to a design and services agreement for the implementation of one of the largest retail parks in Bucharest. A world leader in the iron ore market and a global mining company in connection with its trade operations through Constanta seaport. The global leader in the manufacture of aerospace products on various legal matters related to its facility for production of aluminum components for the aerospace industry located in north western Romania.